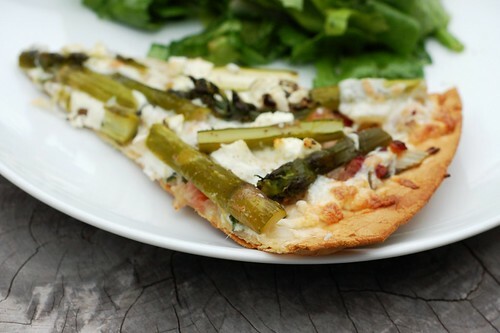 This quick pizza combines asparagus and bacon for a simple but decadent weeknight dinner. If you want to make your own crust, you may want to wait for a weekend to try this since the process will take significantly longer. While the oven was heating up to 425º, I cooked some bacon from the quarter pig we bought from cousin Norah's beautiful farm up in Vermont. Then I caramelized a whole mess of onions in the bacon fat. 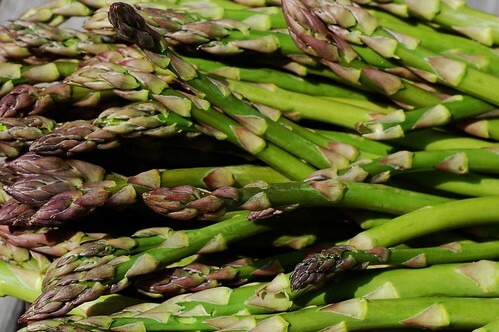 I used leftover asparagus that was already cooked so all I had to do was slice them. While I ran out to the garden to snip some fresh basil and oregano (and smush a whole lot of red aphids that were all over the tomato plants) my husband grated a small mountain of fresh mozzarella. Assembly was quick and easy - bacon and onion mixture then some mozzarella then the asparagus and herbs and a little bit of goat cheese finished with a very light dusting of sea salt and black pepper. Into the oven it went and out it came 10 minutes later, crisped on the edges and bubbling in the center. Slice, slice, slice, slice with our handy pizza cutter and we were in business. 1. Preheat the oven to 425º. 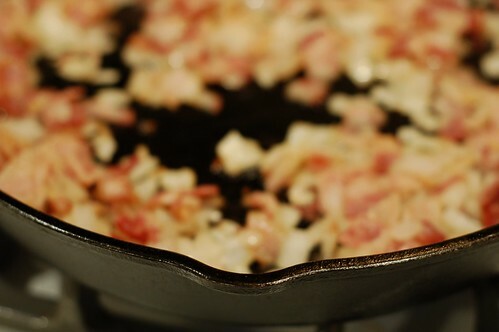 While the oven is heating, cook the bacon over medium-high heat in a frying pan or cast iron skillet. After much of the fat has rendered out but before the bacon is really crispy, toss the onions into the pan and cook, stirring frequently, until they are soft and sweet - roughly 10 minutes. 2. 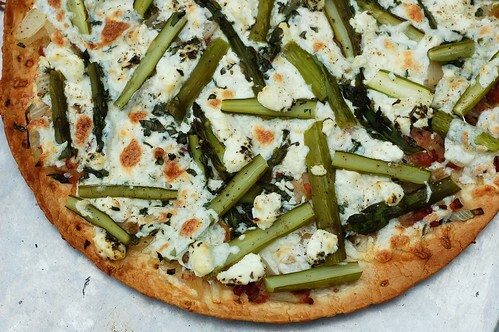 Grate the mozzarella, slice the asparagus spears and chop up the fresh herbs. Once everything is prepped, it's time to assemble the pizza. Place the crust on a heavy baking sheet and begin with a layer of onions and bacon. 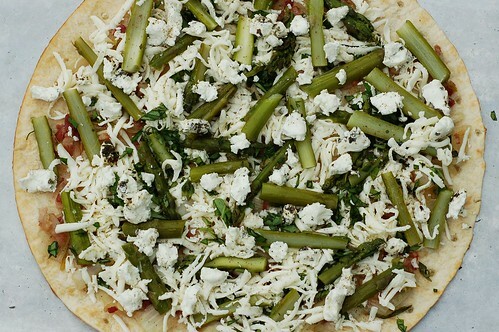 Add half the mozzarella and then the asparagus slices. Add the rest of the mozzarella, the herbs and the goat cheese. Season with salt and pepper to taste. 3. Put the pizza into the oven and bake for 8-12 minutes, until the edges of the crust are browned and the cheese is bubbling. the exact timing will depend on what type of crust you're using. A crust that is pre-cooked will require much less time than one that is not and thicker crusts require more time than thinner ones so just check often if you're unsure. hello! i live next door. why didn't i know of this dinner being served?? you better have saved a slice for me.